I don’t know a lot about East Coast wines in general and didn’t even consider Maryland as a grape-growing region until I recently came across Royal Rabbit Vineyard. But according to a recent article from Wine Enthusiasts, Maryland is the new wine country to watch. “Today, Maryland is enjoying a wine renaissance,” says writer Dave McIntyre “The Free State had only 12 wineries at the turn of the century; that number was up to 85 at the beginning of this year.” And, with just over 900 acres planted to vines, most wineries are planting their own vineyards, predominantly producing estate wines. Such is the case with Big Cork Vineyards. And since I so enjoyed the Barbera from Royal Rabbit Vineyard not that long ago, I thought the Big Cork Vineyards 2015 Barbera would be a good place to begin my Big Cork adventure and continue my exploration of Maryland wine. The grapes were hand-picked, chilled overnight, hand-sorted and crushed. The wine aged in a combination of new and neutral French and American oak barrels for 18 months. Flavor Profile: Pop the BIG cork and breathe in fun and funky aromas of cedar wood and burnt bacon. 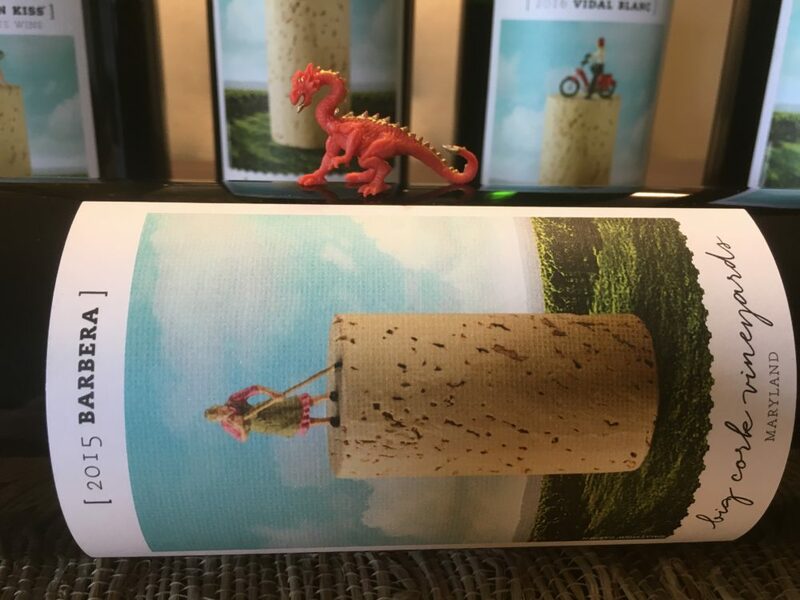 On the pour the Big Cork Vineyards 2015 Barbera is a rich royal red reminiscent of a new vampire’s yet unspoiled blood. In the glass, the Barbera settled into an even darker, richer shade of red — the red of the vampiric leader’s crushed velvet robe. Initial aromas are still strong with that cedar wood and smoked-meaty umaminess. Add to those scents dried black cherries, fire, and matchsticks. Swirl, and the wine releases a bit of burnt chocolate, wet rocks, and fresh currents. On the palate this wine is bright with fruit flavors. One may almost be tempted to call it juicy, except tannins kick in about half way through the tasting and, though light, add a beautiful backbone. Dominant flavors are of fresh, tart red cherries, plums, cedar bark, dried eucalyptus leaves, milk chocolate, and coffee beans. On the finish, these flavors simply melt away and the tannins just brush the tongue, for a solid and complete finish. My conclusion is that this wine is certainly ageable and it would be interesting to see how it evolves in just the next 2 to 5 years. However, this is the kind of wine I enjoy in its youth. So, if you have it, pop the BIG cork now and enjoy. Food Pairing: I paired the Big Cork Vineyards 2015 Barbera with a homemade pizza topped simply with olives and mushrooms. What I loved was how the mushrooms brought out a bit of hidden earthiness in the wine, while the tomato sauce played with the overall brightness and ripeness of the fresh fruit flavors. Meanwhile that undeniable smokiness and woodsiness that underlines the entirety of the wine’s profile was the perfect compliment to a homemade crust. I honestly can’t think of a better pairing. More Info: I received the Big Cork Vineyards 2015 Barbera as a sample for review. (Cheers Amy!) Retail: $36. For more information about Big Cork Vineyards and to order wines directly, please visit the Big Cork Vineyards website.